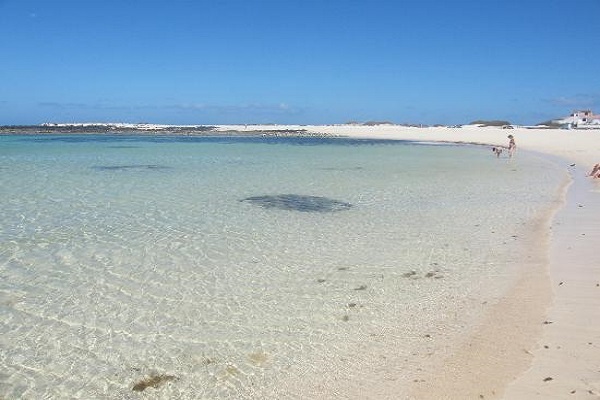 El Cotillo looks set to become the newest tourist resort on the island. The main reason for this has to be the fantastic beaches and lagoons that lie to the south of this little harbour town. Here you’ll find nothing but steely blue sky, dark blue ocean with white foam, and fine white sand. The best advice here is to only enter the water if the waves are reasonably gentle-looking. This is normally during the summer months. If it’s windy, (a lot of the time it is!) there are several nice places for sheltered sunbathing between the lava stones. If you’ve hired a normal car you’d be best to turn right in the town and head towards the lagoons. Unless you are going to eat at one of the superb fish restaurants in town, don’t forget to bring food along with you and of course, plenty of drinking water. This round shaped fort was built in the late 1790’s to defend against invading pirates. The old harbor, with its small bars and restaurants, is the most picturesque part of town and it is here you’ll find most of the bars and restaurants. Just to the north of the Cotillo Lagoons is the Faro – lighthouse.